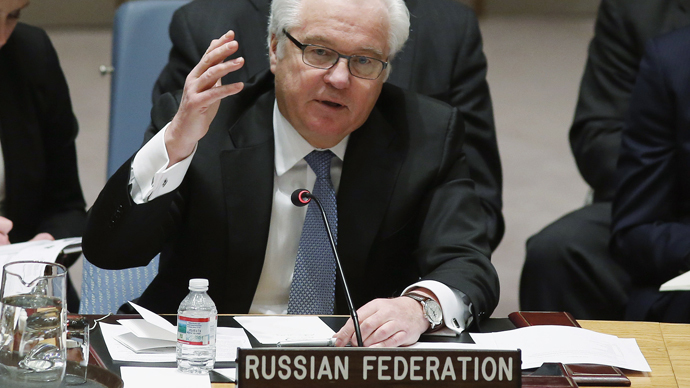 The UN Security Council is paying “lip service” to Yemen’s humanitarian needs – that is the accusation voiced by Russian UN envoy Vitaly Churkin following Friday’s meeting, where Russia’s proposal for a humanitarian pause in hostilities was left in limbo. These comments follow an escalation in casualties in Yemen, as Saudi Arabia stands accused of indiscriminate bombing, claiming the lives of innocent civilians. Thousands flooded the streets of the capital Sanaa on Friday to voice their powerlessness over the situation for the second time in two weeks. "I was prepared to drop a reference to (a call for) an immediate ceasefire, just at the very least they need to have periodic humanitarian pauses to facilitate the delivery of humanitarian supplies, they couldn't even agree to that," the Russian envoy told reporters after the closed-door meeting. “This really shows an amazing indecision and I think lack of understanding of how things are evolving,” the Russian envoy added. Ever since the Iran-allied Shia Houthi rebels expelled President Abd-Rabbu Mansour Hadi, the country has been devastated by fighting. Former President Ali Abdullah Seleh’s forces sided with the Houthis, and the fierce fighting escalated, until in March the Saudi-led coalition decided to bomb the country from the air. This resulted in 12 million people in dire need of humanitarian aid, their homes and livelihoods lost. "The Houthis and Saleh forces have sought to undermine the political transition process and have been aggressively expanding and occupying territory since mid-2014," he added. Whether this is true or not, Saudi-led bombardment has coincided with a steep rise in casualties since March, with hundreds killed and thousands injured. At least that is what the furious protesters are upset about. The five weeks of fighting in Yemen (March 19-April 27) have left nearly 1,250 people dead, the World Health Organization said on Friday. Local estimates on the ground are much higher.